BIOS Fertile D+ is a balanced mixture of the best animal proteins (amino acids and peptides) existing on the market. That mix is the result of tests performed by our technicians on the ground and from the experience of proven farmers. It has been studied to manure with progressive activities, scheduled and protracted over time (6 to 8 months), but at the same time releasing nutrients since the initial stage of manuring the fields. 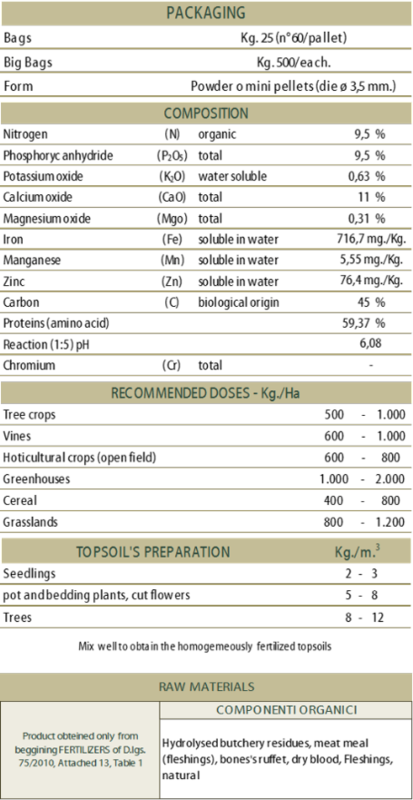 BIOS Fertile D+, both powdered and in pellets, combines quickly with the soil, anticipating its biodegradation process, increasing the humic and fulvic acids and bringing nutrients (macro, meso and micro elements) which are naturally involved in its mixture, and releasing them in short/medium terms, keeping under control any deficiencies, preventing onsets of chlorosis and without releasing any scrap of limestone. BIOS Fertile D+ is ideal for very demanding crops like flowers, first fruits and in mixed-soils. It is essential to spread it uniformly on the soil before ploughing and/or milling; dosed twice a year, it’s an excellent support for intensive crops.